Help you swim smarter, easier . . . faster—and enjoy it more! Teach you to swim a mile--and finish energized, not exhausted. Help you maximize the value of Certified TI coaching. Have learned TI, but want an update/upgrade/refresher. Help you develop Expert level skills. Provide you a lifetime's worth of improvement opportunities. Teach the habits of Mastery. Take your passion for swimming higher and deeper. Do you love learning, practicing, and swimming the TI Way? Are you excited about attaining personal mastery in the most efficient and exacting skills available in freestyle? Have you mastered the TI Foundations in prior videos or the Effortless Endurance (formerly Ultra Efficient Freestyle) Self-Coaching Course? If yes, the Freestyle Mastery Course is for you. Lesson 1: Expert Catch-and-Press Create maximum propulsion with minimum effort. Apply effective and precise pressure to the water: Just the right amount of pressure. At exactly the right time. In the right direction. Lesson 1 includes a 15-minute video illustrating seven learning steps and skill-building exercises; and a 23-page workbook with 26 high quality photo illustrations. The most comprehensive, detailed, and helpful guide ever produced on the freestyle armstroke and how to perform it with maximum effectiveness. If you prefer distance to sprints; want to swim a faster mile—or marathon; swim in triathlon or open water, for fitness or enjoyment, the 2-Beat Kick is for you. Maximize propulsion while minimizing drag and effort. Lesson 2 includes a 17:35 video illustrating 10 learning steps, mini-skills, and skill-building exercises; and a 21-page workbook (with 13 high quality photo illustrations) and priceless tips on every page. The most advanced, refined, and practical guide ever produced to the ultra-efficient 2-Beat. Lesson 3: Expert Breathing Breathe with consummate ease and in seamless coordination with the rest of your stroke. Save energy with every breath by achieving markedly greater relaxation while breathing. Propel more effectively with every breath by fully synchronizing your breath with core body rhythms. Lesson 3 includes a 16-minute video illustrating seven learning steps, mini-skills, and skill- building exercises; and an 18-page workbook (with 18 high quality photo illustrations) and practical guidance on every page. The most advanced, complete, and information-packed guide ever produced to breathing with maximum ease, comfort, and efficiency. Stroke Length is foundation for achieving your full potential. Find the stroke length that’s best for your height and skill set. Completely personalize your range of efficient stroke counts. Accelerate and integrate what you learned in Lessons 1 to 3. Achieve Pace Mastery by experimenting with different combinations of SPL (stroke count) and Tempo. 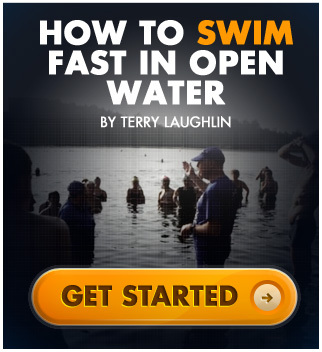 Lesson 4 includes a 7:20 video on which Terry Laughlin shows how to expertly adjust Stroke Length and Tempo to swim precise pace with maximum ease; and a 17-page workbook with detailed guidance on attaining Pace Mastery and how to use a Tempo Trainer to achieve unprecedented awareness of your own stroke, improved efficiency and fluency, and an intuitive feel for swimming faster . . . easier.